This is a sponsored post written on behalf of Tree Top. Read to find out more great gardening tips and activities you and your family can participate in this season! Spring is officially here and it’s time to get the gardens started! Nothing tastes better than fresh food you can eat from your own garden. This year we are trying container gardening as we don’t have a lot of space for an actual garden. This year while our (small) garden grows we spent an afternoon making a milk carton bird feeder. We put it in our kitchen window so we could watch the birds come and eat each morning. Only the birds didn’t come. For weeks. We fed them. The food disappeared, but we didn’t see them come to the bird feeder. The older kids gave up. The littlest one continued to have faith. And then we did see birds. Well, I saw the bird and quietly called for her to come and see. I saw robins and blue jays, sparrows and cardinals. But by the time she was able to run into the kitchen, they were gone. And then finally, one day, she saw one. She was pretty excited to say the least! You can make this bird feeder or try another fun activity by going to KidsGardening.org. While watching our birds we enjoyed some applesauce from Tree Top. Okay, she might have been so excited she tore into the box like a wild animal. But really, it was worth it. 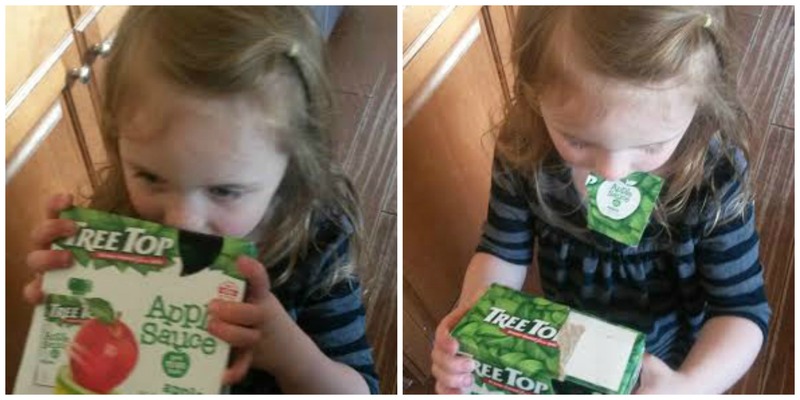 Tree Top is dedicated to raising the highest quality fruit that my kids and I can enjoy together. Tree Top is committed to providing a great product and as a result of that Tree Top is partnering with KidsGardening.org to make an impact on future generations by donating a dollar to KidsGardening.org with every Tree Top purchase. Each donation goes to funding community gardening projects and continuing to raise great apples across the country. Tree Top is located in the heart of Washington’s apple country, Tree Top is a grower-owned co-op, deeply rooted in the communities where we work and live. For more than 50 years, Tree Top has been a trusted brand dedicated to delivering top-quality products and premium ingredients such as juices, smoothies and sauces. We love that Tree Top Apple Sauce Pouches are mess-free, taste great and are made with pure fruit. They are also squeezable, making them perfect for on-the-go snacking. Today we’re giving you the chance to win your own gardening set. Forty winners will receive a gardening set worth $60! My kids would like it all but my daughter definetly would LOVE to plant 5 kid friendly flowers. I would love to plant our first garden together!